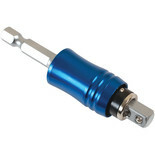 A single off line driver bit holder, designed for use use with corded and cordless drill drivers, and perfect for access to awkward and difficult to reach places. 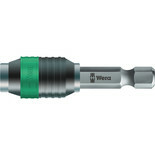 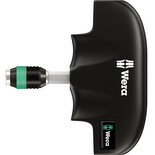 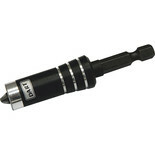 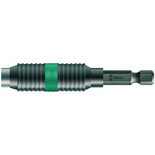 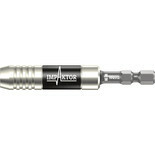 Power tool adaptor 2 in 1 takes 1/4"Drive bits and 1/4"Drive sockets - 75mm long 2 in 1 Adaptor. 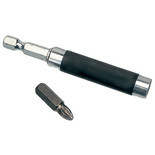 Universal bit holder for use with 1/4" hexagonal screwdriver bits. 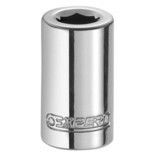 Stainless Steel sleeve and strong permanent magnet. 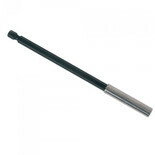 152mm long. 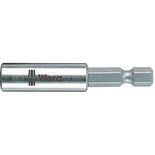 Universal bit holder for use with 1/4" hexagonal screwdriver bits. 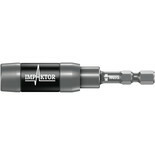 Stainless Steel sleeve and strong permanent magnet. 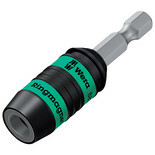 Magnetic screwdriver bit holder will hold screws onto 25mm insert bits. 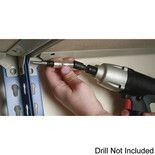 This bit holder makes it quick and easy to use and saves time when trying to remove awkward and hard to reach screws.